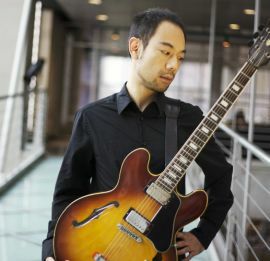 Satoshi Kataoka is a guitarist, composer and arranger living in New York City. He attended the Jazz Performance program at The City College of New York where he studied with world acknowledged musicians like, John Patittuci, Mike Holober, Scott Reeves and many others. Satoshi has had opportunities to play with some great players such as John McNeil (Horace Silver, Tom Harrell, Billy Hart, Bob Brookmeyer), Joe Martin (Chris Potter, Brad Mehldau, Fred Hersch, Maria Schneider), Jochen Rueckert (Mark Turner, Marc Copland, Pat Metheny, Sam Yahel) and many more. In 2015, he has released his first album, “Fall Into the Place” which consists of all his original pieces from the Surca music. The album recorded with Adam Kolker (Billy Hart, Paul Motian), Pablo Menares (Melissa Aldana’s Crush trio, Claudia Acuna) and Allan Mednard (Kurt Rosenwinkel, Aaron Parks). He has been actively playing in the city since the college years at the venues such as Iridium, Smalls, Fatcat, ShapeShifter Lab and many other places. He’s been playing in some different groups as well as his own trio, quartet, quintet and larger ensemble.